The Washington Post editorialist says that mere airstrikes are bad because they result in civilian deaths, cause displacement and aid al-Qaida recruitment. Therefore, we should invade and occupy countries instead. But Thursday's U.S. operation had a distinct downside: At least two dozen other people were killed in the attack, some of them apparently civilians. Al-Shabab responded defiantly, and Somalia-watchers said new leaders for the militia and al-Qaeda will quickly come forward, while fresh recruits may be gained through a backlash against the American intervention. . . .
Somalia itself, meanwhile, has grown steadily more dangerous. The government, which is backed by Ethiopian troops, has lost ground to Islamist and tribal insurgents, and fighting has destroyed a large part of Mogadishu, the capital, while displacing up to 60 percent of the city's population, or 700,000 people. Famine is a distinct danger: The United Nations says that 2.6 million Somalis are in need of food aid and that the number could rise by the end of the year to 3.5 million -- half the country's population. Somalia is a cautionary example for those who, like Barack Obama, favor rapidly withdrawing U.S. forces from Iraq and managing any threat from al-Qaeda with an "over the horizon" strike force. Such forces indeed have the ability to target and kill leaders. They do nothing, however, to change the conditions under which al-Qaeda finds refuge and recruits. It's hard to recall a more incoherent argument than this. Self-evidently, every problem that Hiatt argues is created by "mere" air strikes against other countries is magnified by many magnitudes by the types of invasions and long-term occupations which Hiatt cheers on for Iraq. Unlike the handful of civilians killed by the Somalian air strike, Hiatt's Glorious War in Iraq has resulted in the deaths of hundreds of thousands of dead Iraqi civilians (though the exact number is debated because we don't really bother to count). While 700,000 people are displaced in Somalia due to internal strife, Hiatt's Glorious Invasion and Occupation of Iraq has resulted in the displacement of 4 million Iraqis. While continuous U.S. bombing of countries in the Middle East and North Africa obviously inflames anti-American sentiment around the world, thus aiding Al Qaeda's recruitment, Hiatt's desired endless occupation of Iraq does more for that cause than any other policy. Citing the harms from air strikes on Somalia as a reason to continue to bomb, invade and occupy Iraq is the height of incoherent self-justification from a desperate and disgraced war cheerleader. Successful counterterrorism requires providing security for the civilian population, economic reconstruction and the brokering of political accords -- in other words, nation-building. That's as true in Somalia as it is in Iraq. BAGHDAD (AFP) - A US air strike damaged a hospital in the Iraqi capital's violent Shiite stronghold of Sadr City on Saturday, injuring 20 people, as American forces claimed to have killed 14 militiamen. . . . However, witnesses and an AFP reporter at the scene said the main Al-Sadr hospital had been badly damaged and a fleet of ambulances were destroyed. . . .
Hospital staff said at least 20 people wounded in the air raid were taken to the same hospital which had its glass windows shattered, and medical and electrical equipment damaged. Doctors and hospital staff were livid they had been hit. "They (the Americans) will say it was a weapons cache (they hit)," said the head of Baghdad's health department, Dr Ali Bistan. "But, in fact they want to destroy the infrastructure of the country." He charged that the attack was aimed at preventing doctors and medicines reaching the hospital which is located inside an area of increased clashes between American troops and militiamen. The corridors of the hospital were littered with glass splinters, twisted metal and hanging electrical wiring. Partitions in wards had collapsed. The huge concrete blocks forming a protective wall against explosions had collapsed on parked vehicles, including up to 17 ambulances, disabling the emergency response teams. Nurse Zahra was recovering from the shock of the attack. "I was very afraid. I thought I would die. Everyone was scared. They ran in all directions," she told AFP. "Now I am more sad than frightened because hospital facilities have been destroyed." Hospital guard Alaa Mohamed, 26, was at a side entrance when the bombs exploded. "There were five missiles that exploded outside the parking lot," he said. An AFP reporter saw three huge craters, each with a diameter of six metres (yards), created by the impact of the explosions. Youngsters climbed on top of the rubble and looked for anyone trapped underneath. We have a huge crisis of refugees inside and outside Iraq. We have a total failure of the -- of the civilian -- the civilian structure and what's happening inside. We have the sectarian divisions increasing. We didn't have that before. Now we have it. So, basically, my assessment is we have a whole nation called Iraq, now it's wiped out. Just like Fred Hiatt says: merely bombing countries is bad because it results in civilian deaths, causes displacement, and makes Muslims mad at us -- and we can't have any of that. That's why we must, instead, stay in Iraq forever and continue to drop bombs on hospitals which prevent those we're fighting against from seeking medical care -- acts which, if intentional, are war crimes by any objective measure -- and why stopping those activities and withdrawing from that country would be really terrible. Because that behavior -- endless occupation and war, which Hiatt craves even more of -- entails none of the problems of mere "over the horizon" bombing campaigns. That's the twisted, muddled mind of today's war cheerleaders seeking justification for the endless carnage they know they've unleashed. Just like any other day, the Hussein family was getting ready for lunch at their home in Baghdad, Iraq, when the house suddenly shook and the brick walls came down around them. That was the dramatic account told to ABC News by the parents of 2-year-old Ali Hussein, the Iraqi boy killed during a fierce battle in Sadr City Tuesday. Dramatic photographs of Hussein's dust-covered body being pulled out of the rubble of his home appeared on front pages and TV news reports around the world. When a U.S. patrol in the Shiite militia stronghold was fired on by a dozen fighters, American forces fired 200-pound guided rockets that devastated at least three buildings in the district. The U.S. military said 28 militiamen were killed. Local hospital officials said dozens of civilians were killed or wounded. 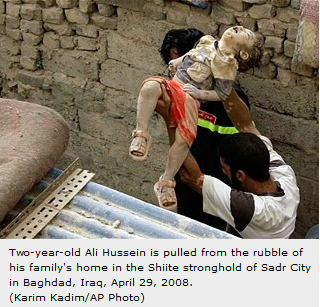 Hussein's mother recounted being buried in rubble and crawling around the home, looking for her children. . . . The parents called on both Shiite militias and the U.S. military to stop operations in the violence-torn district. And they criticized American military efforts that resulted in the deaths of civilians. "You attacked civilians' houses crowded with people for the sake of a few militants," said Hussein's father, his face in tears. "A considerable number of people were killed for the sake of killing four." Although the parents did not mention it, they may qualify for condolence payments, which are made for death, injury or battle damage resulting from U.S. military operations. Such payments can range from $2,500 per incident to $10,000 per incident in extraordinary cases. What kind of ungrateful parents fail to mention the kind and generous $2,500 payment which might -- or might not -- be given to them by the Freedom-Spreading people who just killed their infant? That's what the Fred Hiatts of the world have on their hands and what they would have on their consciences if they had any. And now, so the logical conclusion of his argument suggests, he wants to do for Somalia what he did for Iraq -- invade and occupy them rather than just drop our Freedom Bombs on them. All the while, he has the audacity still to issue self-righteous warnings to those who opposed his repulsive debacle, such as Barack Obama, of the "cautionary tales" that come from a handful of dead civilians from mere air strikes. Air strikes sure are terrible because they result in dead civilians. Therefore, we better not leave Iraq. Then again, none of this really matters. We probably should just go ahead and continue this slaughter and endless occupation under John McCain because of Jeremiah Wright.